The NewTek TriCaster Mini Advanced HD-4 Educational Version with Educational Curriculum is available to schools and educational institutions only. It consists of the TriCaster Mini Advanced HD-4 and is supplied with an electronic educational curriculum on a USB flash drive. The TriCaster is a compact, all-in-one multimedia solution that allows you to simultaneously broadcast, stream, and record live productions from virtually anywhere. The eight-input switcher makes it easy to switch between four HDMI or eight NDI video sources, mix audio, add graphics and titles, and add advanced effects like virtual sets and animated transitions. Using the same intuitive and fully featured control software as the rest of the TriCaster professional line, the TriCaster Mini is suited for both new users and seasoned pros. In addition to the four HDMI inputs, you can choose from four NDI devices on the network, including computers, PTZ cameras, or even wireless capture devices. Two HDMI outputs are provided for sending the Program output with audio to external devices, with video-only HDMI and DVI outputs available for monitoring the multiview output and user interface. 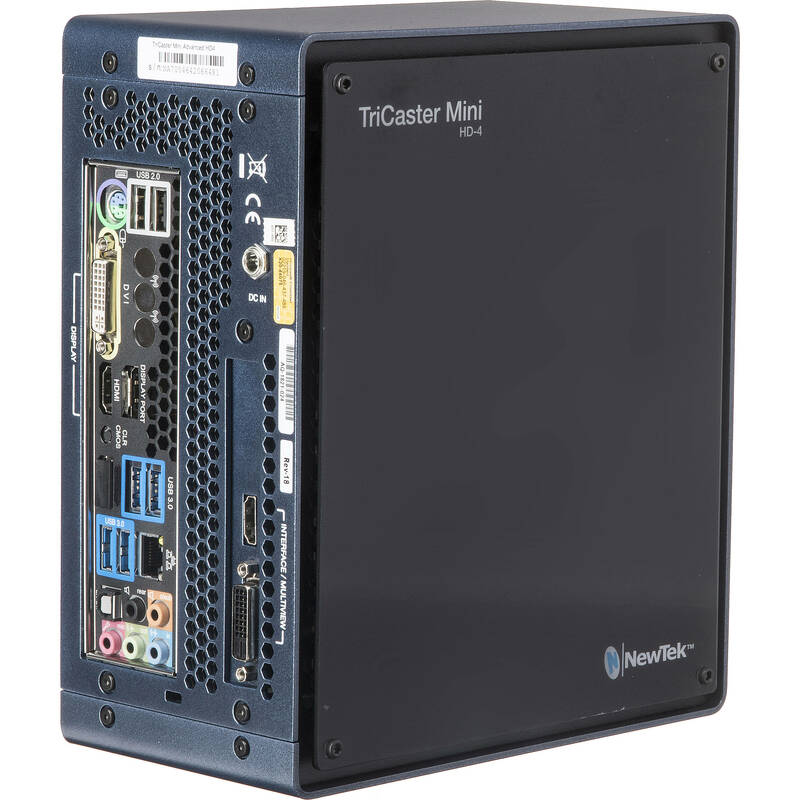 The TriCaster Mini can record up to four simultaneous video input or output signals at full resolution to the internal 750GB storage drive, providing up to 15 hours of HD video recording. You can also record to external drives connected via USB 3.0. The TriCaster Mini supports live streaming with presets available for industry-standard live content delivery networks such as YouTube and Facebook Live. Additionally, you can save a web-ready streaming file for later upload to popular social media or video-on-demand sites. This is the same as the non-educational version, except it is only available to schools and educational institutions only, and is not available for teachers or students. The included educational curriculum comes on a USB flash drive and is used to teach your students how to use the TriCaster Mini Advanced HD-4. The TriCaster Mini Advanced makes it possible for anyone to start creating multimedia content without the need for additional software or equipment. With just one system, you can switch between eight video sources, mix audio, add graphics and titles, and add advanced effects like virtual sets and animated transitions. You can also network with computers and wireless devices for presentations and screen sharing, stream to the web, publish to social media sites, and record content for later viewing. The compact size of the TriCaster Mini Advanced allows you to produce and stream content from virtually anywhere. It's small enough to fit into a backpack for easy travel, and doesn't require a studio full of gear to use. The Advanced TriCaster software built into the switcher provides compatibility with NewTek's NDI A/V protocol, as well as Audinate's Dante audio protocol (requires separate Dante Virtual Soundcard license). All available video and audio inputs can be utilized by network connectivity, allowing video and audio devices to exist on a standard IP network without the need for routing expensive and cumbersome video and audio cables. Access up to four live Pan-Tilt-Zoom (PTZ) robotic cameras via standard serial and network protocols, with native preset system and user interface control over camera orientation, zoom, focus, and iris. The multichannel audio mixer within the TriCaster software lets you manage camera audio, including internal and external audio sources, outputs, recorded audio, stream audio, and headphone output. It supports Master and Aux output mixes. Recorded media is stored to internal 750GB storage drive, accommodating approximately up to 15 hours of HD video recording. Media can also be recorded to external storage drives connected via USB 3.0. TriCaster Mini supports HD live streaming with presets with common streaming profiles and custom multi-bit rate streaming profiles (including RTMP streaming and browser-based streaming applications), and autosave of web-ready stream files for video on demand (VOD) upload. Upload video and images directly to social media sites such as YouTube, Facebook, and Twitter; export content to FTP servers, and copy files to attached or networked storage locations. An external monitor is required for viewing the user interface and for multiview display. The TriCaster Mini has HDMI and DVI outputs for hooking up an external display. Use macros to record your favorite go-to settings, commands, or operation sequences, and then create custom one-step shortcuts to simplify or automate control. Support for standard MIDI protocol enables third-party MIDI device control of TriCaster operations via macros. Box Dimensions (LxWxH) 22.0 x 17.0 x 11.5"